I've been enamored by the Cretor popcorn engine for some time. First job has been converting dimensions from metric to imperial. I have some idea about what dimensions are critical but no doubt many parts will be remade. This model will be a huge challenge for me. Fabricating the governor, whistle, and inlet manifold all represent some firsts (perhaps some seconds) for me. The crosshead guide looks to be the most challenging. I expect to make the flywheel according to Stew's plans. The 2nd picture is a CAD drawing of the crosshead guide. Unless there's good reason not to, I expect to make it from 12L14. But what's got me stumped is machining that transition from the two inner diameters (see red arrow). Thoughts? Other than the crosshead guide, all other material is brass, aluminum, and stainless steel. If price were not an object, any thoughts on using 303 for the guide? The guide should be the 1st thing I go after but I'll probably start with some of the smaller bits...mainly to get into the swing of things again and gain some immediate success. Drat. Here I am developing a project and T comes in with a project of her own that involves me. We all understand where my priorities lie, right? That is, I like getting fed. Looks like a great project, will need to while watching. I like 303 for good machining and it does not rust like 12L14 loves to. For large chunks, go check the Drop Zone part of Yarde Metals website, they usually have big diameter bar at cheap rates, selection varies since they are offcuts from their commercial sales. 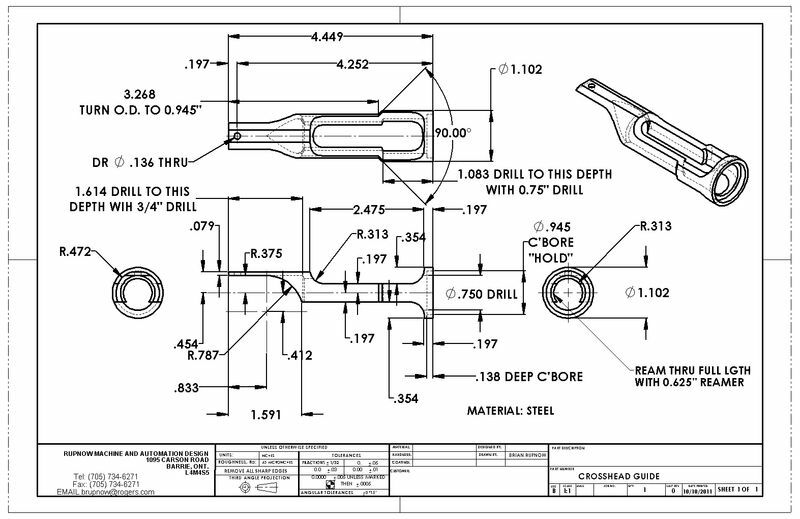 For machining that one section, if you use a boring bar on the lathe, with the narrow end of the crosshead in the chuck, you should be able to do that no problem. 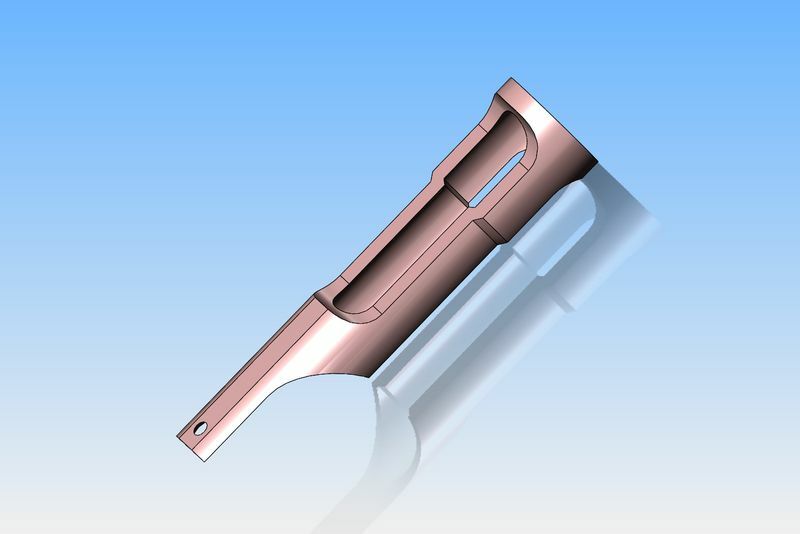 Also face the end to the cylinder and bore the guide area at the same time. I would turn the whole thing to rough shape and cut all the sides open first, just in case the metal relaxes any from manufacturing stresses, even a tiny movement would throw off the bore if it was done first. Then do a light finish cut on the contact areas. Set your topslide over before you bore the large diameter using the carrage feed then you can cut the transition with the compound, it's just a tapered bore. Well I’m glad you are starting another build. I didn’t want you just lounging by the pool and gardening all summer; a man needs a good excuse to go inside for a cool off and one tends not to spend their evening swilling Kentucky rot gut, if they have a build going, well that’s my excuse anyway . But here’s my biggest concern: have you been eavesdropping on my PM’s? Just last week I started conversation with two of our members ( unnamed) in regards to my starting of the Cretors Lil’ Popcorn Engine from Myers Castings. I swear, I ain’t lying, you can ask Bill and Tug . However, I think this is wonderful that we’ll be building the almost same engine, but, you from bar and I from castings. This could be an award winning mini-series . Have a great holiday (bet you have been around a lot of “real celebrations” ) in your younger years. New miniseries this summer, Popcorn Wars!! you could always learn to cook. And compete with T? I don't think so. Just think of the potential issues. Besides, I'd still end up doing all the dishes and that's just not fair. No no. She cooks. I clean. We are happy. @Chris. Thanks! I may do a trial with some aluminum. I have a good length of that. If (I mean, when) that goes well then maybe I'll go for the stainless. I would prefer that to the 12L14. I'm not sure I can do the open spaces first. The part is about 4" long and I was going to use a standing follower at one end. Do the boring then move to mill for the open spaces. If I do the open spaces first then I don't know what I can hold onto. Are there alternatives? I recall (I believe it was Bob or Rick) mounted the part on the carriage and used a boring head mounted in the chuck. But his was a casting. Thoughts? @Jason. Thanks. I'll have to get my mind wrapped around that one. Are you saying to do both diameters and then the transition? @Cletus. As part of watching my back...I have my spies. I anxiously await your build. Yes do the smaller cross head guide hole first then open up the larger dia using the power feed and finally change to using the topslide handwheel to do the angled transition all in one setting. I prefer to bore holes into solid metal, any interuptions can cause an out of round hole, you can also hone and lap while solid. Firsts are what make this hobby so rewarding. I look forward to your updates with this build. Thanks Jason. And that was a very useful picture too! Thanks Brian. Both helpful and concerning. Concerning in that your dimensions are so different from mine. Firstly, your overall length is 4.449 while I have 4.0. Outer diameter is 1.102 while mine is 1.125. The latter somewhat less concerning than the former. I suspect I took some liberties in that I tried to maintain dimensions in multiples of 1/32, if not 1/16. Helpful overall. It answered some questions. Time to review my drawings. Is there a reason why one spec shows to drill with 0.75 while another shows 3/4? Tolerance? I note the 0.75 spec is in the area where the crosshead slides. .750" +- .002" or what ever specified, 3/4"+- 1/32", or near enough, measure with a rule instead of a mic. Here is the one I built using Brian's plans and build log. Fun project. I used 12L14 for the cross head and a brass flywheel casting.